So if they are saying their testing is done a recommended usage levels, that means the concentrate has already been mixed/ diluted before the test and they are testing the mix rather than just the concentrate. That’s exactly what I thought it meant. I think it’s misleading to a lot of people. thanks for clarifying. “testing done at recommended usage levels” does that mean they test after it’s mixed with Pg/vg??? All reports / info in tables above are based on ORIGINAL liquid in a bottle that you buy (= not in your mixes). This was the first thing to check for me (not saying that all is 100% true everywhere, but i would realise the misleadings if they were any, since those are not that difficult to find). Most companies are using independent companies for testing, to get proper results. I also added a calculation, how can you check the amount of diketones in your mixes (check FLV section). Example: their Coconut contains the largest amount of Acetoin of all their flavors (2,800 ppm = 0.28%). FLV flavors are super concentrates and you use them at 1-2% usually. It means, that when you use 2% of FLV Coconut in your mix, then the result is 2,800 ppm x 0.02 = 56 ppm of Acetoin in your vaping liquid (which is 0.0056%). FLV Coconut flavor contains has also 187 ppm of Natural Diacetyl (Natural Diacetyl in some flavors is formed naturally during the flavor extraction process; it can’t be formed in large quantities naturally). So, when you use 2% Coconut in your mixes, that means 187 ppm x 0.02 = 3.7 ppm (which is 0.00037%). Completely irrelevant if you ask me and usual testings wouldn’t even show any traces of ND in your mix. Another example: TPA Coconut Extra. Their report says <10% of Acetoin in this flavor (could be either 100 or 100,000ppm; but we assume it certainly is more than 5%, otherwise they would write ‘up to 5%’, right? So let’s take the middle number 7,5% in this calculation = 75,000ppm). TPA flavors are not so concetrated, so let’s use 3% on Coconut Extra in our mix and that give us a result 2,250ppm of Acetoin in our mix (40 times more of Acetoin then in our Coconut FLV mix above). And if you’re making Castle Long V2 recipe http://e-liquid-recipes.com/recipe/58929/Castle%20Long%20Clone%20V2 for example, then you also need Brown Sugar, which has <5,000ppm of Acetoin and <5,000ppm of AP. And if you use 2% French Vanilla Deluxe TPA instead of vanillin, this one also contains 10,000-50,000ppm of Acetoin and up to 5,000 ppm of AP. Another example: http://e-liquid-recipes.com/recipe/99179/Bust-a-Nut recipe, which is also one of the most popular recipes (I love your recipes @Alisa). Alltogether your Bust-a-Nut mix contains over 4,000ppm of Acetoin. But it is delicious. You should also be aware, that many premium liquids are also using flavors of these companies above, so you may want to check reports from their testings if you care about diketones. I haven’t realized before that RF has the info shown which flavors do contain A/AP before. Thanks for your input @woftam. I updated info about RF and i will add the info in the top table soon. Thx for your contribution. They can type in their lot number and get the exact test results for that bottle. The results shown are not testing done from other batches or super old as you may find with some companies but the actual results for that lot number. 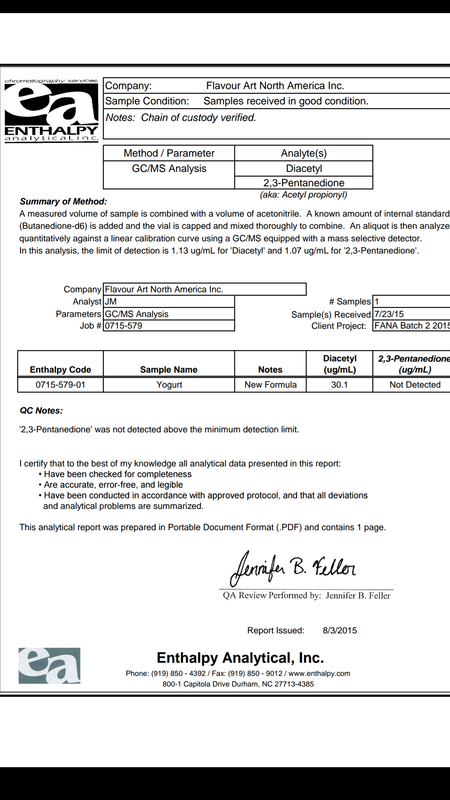 (We own our testing equipment).Currently, if you are a wholesale customer, it will give you TPD Statements, CAS numbers with percentages, and the FDA master code if it is on file. Hi @Walt_RealFlavors. This is so great info and i’m glad you’re around. Can you pls tell me where can i get those lot numbers? As far as i understand those lot numbers are found on a bottle/packaging which i buy. But this is a problem, i wish to get info about diketones before my buying, not after. Can you provide those lot numbers, please? Ty so much. Let me see if I can create a program to generate a list of lot numbers and we can see about it publishing it on the site. Without the lot numbers, we still have the general testing (average results) on the product image. 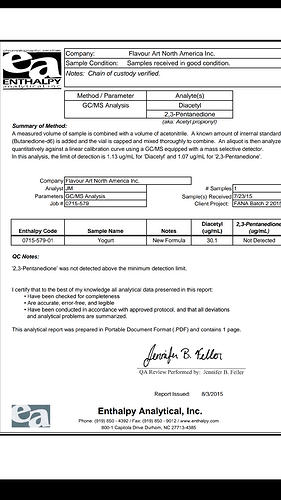 I’ve read that each batch of flavoring Real Flavors produces is tested and approved before you ship and that you keep batch testing reports on all lot numbers for 3 years (very transparent and thoughtful, but slightly more difficult with lots of different lot numbers i assume). Otherwise, a simple table would be the best (easiest to follow and to decide for customers who care about these things). This would be totally enough! I guess noone really cares about the difference in between 547 or 583ppm (or +/-5%), but this would make table simple and easy to follow for those who care. And those rare customers who want to check about their particular batch, they can find those info based on lot numbers on your website. I would first like to say that I appreciate the amount of personal time and effort that you have put into your project. I applaud it, because it is important for flavour companies to be transparent to us the consumer. That having been said, I have a couple of notes for you. Wonder Flavors- I spoke to Frank Eblender some months ago on the issue of diketones in his flavorings, as I had purchased several and had sensitivities to the first 3 that I had tried. His response at the time was that testing had not been done, but that I should expect most of, if not all of his flavors to contain diketones. He did not seem to feel this was an issue. To say that the threshold of significance for Acetoin (or any chemical) was 100ppm, and to state 10ppm was irrevelant is false for some people, though it may be to many. My body can in fact detect Acetoin at 10ppm when a flavor is used at 6-8%. So I’d like to avoid even what you might call trace amounts. Naturally Occurring diketones are for me, just as harmful as added diketones. The diketones present in naturally occurring for in FLV Caramel, Cream, and Vanilla Custard, for example, are strong enough at .25% in a mix to give me a Cluster Migraine within 3 minutes of vape time. I think that those of us who reaction to diketones in our liquid would tell you that there is not a great difference in effect between naturally occurring Diacetyl and added Diacetyl. A. My first issue is the one about the ones intended for cooking and not vaping. If you were to enquire about the flavours that are diketone heavy or oil soluble, you would find that they do not label them as safe for vaping. In fact, they label them as oil soluble or not intended for vaping. They have banned the sale of those flavors for sale in US based vape flavour companies because they do Not want people to use them in the creation of Eliquid flavors. Some diy companies have in fact gone through the back door to obtain these flavors (such as Pandoro or Butter) by purchasing from third party entities, but Flavour art does not sell them to DIY companies themselves here in the U.S.
B. The Clear Stream Technology initiative is significant, and Flavour art is the only big flavour company to both submit to testing And publish findings. As I said before, I am extremely sensitive to D.A.A.P. as well as artificial sweeteners, even having issues with as low as 10ppm. I have never had an issue with a single FA flavouring, and I use their flavours almost exclusively now, because they are the one company I can trust not to make me ill. I am not a paid spokesperson, just a person who would not still be mixing/vaping today if Flavour Art did not exist. And I am not the only one. If you look at Dr. Farsalinos comprehensive studies of the effects of vaping versus smoking, you might be surprised to note that he chose to use Flavour Art liquids. Flavour Art is One of ONLY Two Companies, (the other Being REAL FLAVORS) giving Tens of Thousands of Dollars MONTHLY to vape Advocacy and Research. No other flavour companies do that, to my knowledge. Flavorah doesn’t spend a penny on advocacy efforts, even though their claim to fame is that they started as a vape flavors company. This is worthy of note. I hope that you’ve not taken me to come across as rude, as it is most certainly not my intention. I only wish to help out, as harm reduction is literally what I strive for. Wonder Flavors- I spoke to Frank Eblender some months ago on the issue of diketones in his flavorings, as I had purchased several and had sensitivities to the first 3 that I had tried. His response at the time was that testing had not been done, but that I should expect most of, if not all of his flavors to contain diketones. VERY much appreciate your sharing this information! I’ve seen WF listed, but hadn’t seriously considered them yet, as I’ve not read much about them. But given what you just shared, it would seem that I need to move them way up the list on my “brands to check into” when considering new purchases!! Also, very sorry to hear about your experiences/sensitivities to migraines WRT diketones. I can definitively relate, as I’m sensitive to PG past a point. Reason #1 why information coming to light is a great thing. This way we can maximize our chances for success in staying away from tobacco, while catering to our individual needs/goals! Again, appreciate your mentioning this, as I have pandoro, and was planning on buying butter in the very next order! If you have any links on this that either expound on, or simply “back up” (not that I’m insinuating anything, just a firm believer in the old adage “trust, but verify” when it comes to the important things) the bit about these two being oil based, I’d be indebted!! Is anyone familiar with fa butter? I just threw it in my cart to try, but there really aren't any notes on it on the calculator side. Thought you might also appreciate the additional info. @Sprkslfly- As for FA Whipped Cream, Pandoro, and Butter, this Is why I tried to say " ‘Or’ not intended or safe to vape". They are not Oil Soluble, they are water Soluble, but they Do contain diketones, and Flavour Art has been making a great effort not to put diketone carrying flavors into the hands of diy mixers. This is why they have redone a number of their flavours to remove Diacetyl in favor of Butyric Acid. Which appears to have less of a harmful effect on the lungs. A couple of examples are FA Yogurt, and FA Condensed Milk. Two flavors that used to contain Diketones but now do not. I will attempt to find the published evidence on this, but I did want to clarify right away. I hope that this helps with backing up some of what I’ve said. OK! Thank you for the clarification! While you were replying though, I just did some cursory checking, and the results were indeed interesting. Not one of my go-to vendors (Bull City Flavors, GremlinDIY, NicotineRiver) had either FA Pandoro or FA Butter listed for sale. EDIT: it appears it was just coincidence. Again, no oils involved in these. No no! Again, I’m not calling you out, don’t take it wrong, just that you hit a critical note for me in regards to the oil, and only the oil factor! I know they’ve redone a number due to diketones etc. But oil is a proven no-go, so I try to take note when that topic is raised. That’s why I was hoping for more information to read about flavors confirmed to contain it! That’s all! You are fine!! I would be the same way in regards to oil soluble. I did not take offense, but rather took it as an opportunity to improve upon the information I was providing. No worries, all is well! Flavour Art is the ONLY Company giving Tens of Thousands of Dollars MONTHLY to vape Advocacy and Research. Umm… I beg to differ… We have two full-time lobbyists, a former US Senator, and a law firm working around the clock with other advocacy groups, in fact, I am the President of VARS. In the last six months, we have spent over $150,000 on these projects. We honestly just do not market it or scream at the top of our lungs that we are paying for all this. We work as a community. Sorry, that comment sort of ruffled my feathers a bit. @Walt_RealFlavors, my most sincere apologies! I had no idea! Allow me to ament my first statement. I will say for the record, that I appreciate your advocacy efforts so much more than you know. I also appreciate that you are being transparent and trying to make sure your flavors are as clean as possible, as well as marking those that have even trace amounts of DAAP. It was not my intent to slam you even indirectly. I really do appreciate you in the community.